Courtney Barnett and Kurt Vile are in California this week celebrating the release of their collaborative LP Lotta Sea Lice. After performing at KCRW’s Morning Becomes Eclectic on Tuesday, an Amoeba in-store on Thursday, and a headlining slot at Desert Daze in Joshua Tree over the weekend, it’s time for the duo kick back and dip a toe in the Pacific waters. 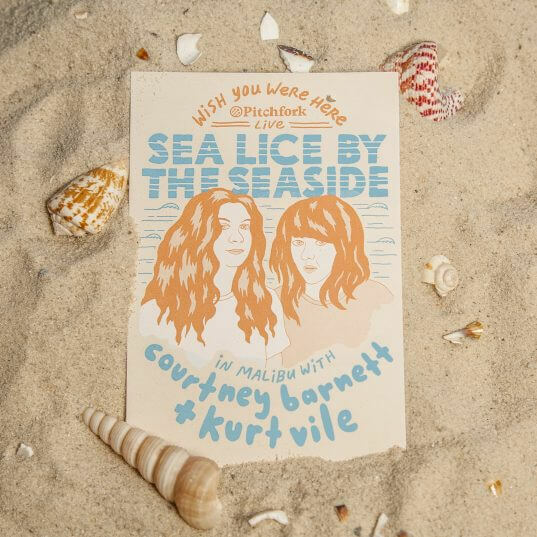 “Sea Lice By The Seaside”, a Pitchfork Live webcast, features Courtney, Kurt and their all-star backing band performing tracks off of the new record at an ocean-side Malibu mansion. The continental breakfast spread is rumored to be excellent. Pitchfork’s webcast is live Today at 2pm EST/11am PDT, watch the stream here.